Eleanor Estes (1906-1988) was a children’s author and librarian. I have to believe that having surrounded herself with children’s books helped her to understand what makes them tick. She attributed her storytelling to her mother’s love of books and her unending stories and anecdotes. She worked in the children’s section of the New York Public Library until 1941, when she was confined to bed with tuberculosis. It was at this time that she began writing. She based much of her writing on her family, especially The Moffats series. 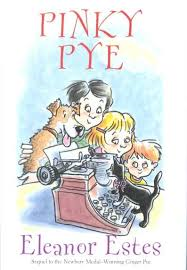 Ms. Estes won the Newberry Medal for Ginger Pye (1951). Three other books were Newberry Honor books – The Middle Moffat, Rufus M. and The Hundred Dresses. The Moffats won the Lewis Carroll Shelf Award in 1961. In 1970, Ms. Estes was nominated for the Laura Ingalls Wilder Award. 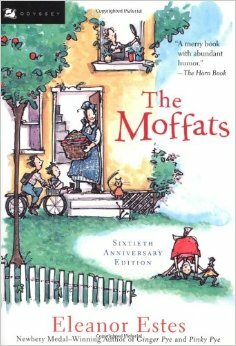 The Moffats is a series of four books about the Moffat family. There were four young children and their mother and the books focus on daily life in working class America during WWI. Books in the series include The Moffats (1941), The Middle Moffat (1942), Rufus M. (1943), and The Moffat Museum (1983). 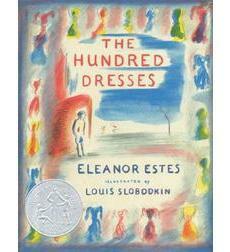 The Hundred Dresses (1944) has never been out of print! An impressive accomplishment in the middle grade genre! 🙂 In this story, Wanda is ridiculed for always wearing the same blue dress to school. She tries to stand up for herself, claiming that she has a hundred dresses at home. She is pulled out of school when the family moves to a big city in the hopes of avoiding such ridicule. One of her little classmates feels guilty for not defending Wanda when she was being ridiculed, and this guilt colors her days from then on. These books may have been written in a different time, but the message is timeless. Thanks for this post. I am fascinated by children’s books and am actually writing poems and picture books for my young grandchildren which I may try to publish. I feel for Wanda as I was mercilessly teased at school because I only had 1 red dress and I wore it whenever I was not in uniform. I actually stopped meeting up with friends because I was so embarrassed. So I must buy this book! Fabulous that you are thinking of publishing your stories! 😊 the world needs as many stories as we can put out there, especially for kids. If you are interested in kids books, you can scroll back through my Saturday posts from the last year. 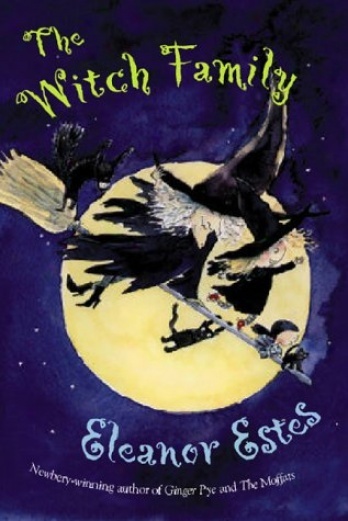 I have spotlighted a different children’s author each week.